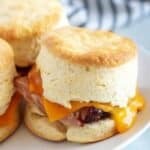 Our cheesy ham biscuits recipe featuring flaky buttermilk biscuits loaded with smoked ham and gooey melted cheddar cheese! 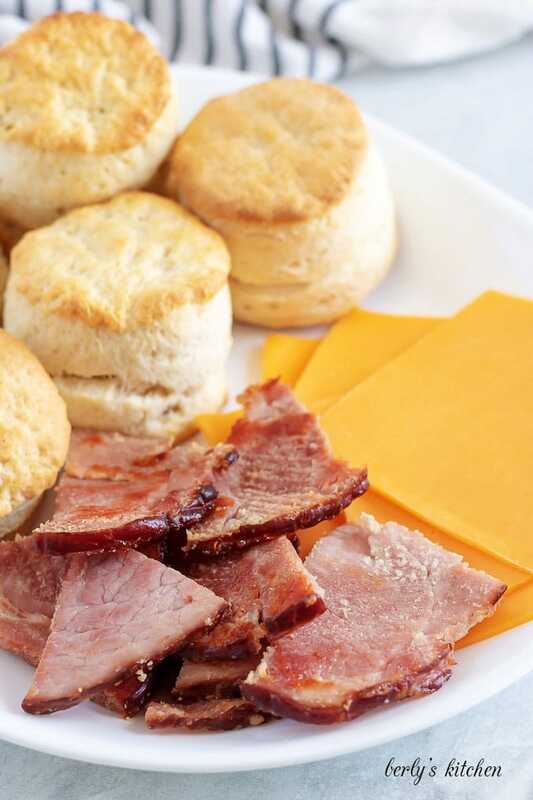 Honestly, I’d like to say our cheesy ham biscuits are a Southern classic, but I simply don’t know if that’s true. However, what I can say, is that I grew up Texas and Arkansas and these were commonplace in a lot of restaurants. In fact, the restaurant that Kim I and worked in, when first met, served something similar. Furthermore, it’s a very popular eatery that specializes in, “Southern,” cooking. Which leads me to think, ham biscuits are pretty well liked across the South. Now, before I go any further, I want to be transparent. The biscuits we used in the photographs are homemade. You can click the link, homemade buttermilk biscuits, to see the recipe. 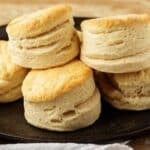 But, if you look at the recipe card, you’ll see I recommended using canned or store-bought buttermilk biscuits. This was done because we get better reception, from our readers, when we use some processed ingredients in our recipes. Okay, now that we have all the formalities out of the way. Let’s get these puppies started! First of all, get your biscuits into the oven. Follow the directions on the package and once they’re in the oven, you can get the ham going. Grab a large skillet and set it over medium heat. Cook the ham, on both sides, until it browns a little, then remove it from the heat. By that time, your biscuits should be done. At this point, you should try and get the cheesy ham biscuits built while the bread is still hot. That way the cheese melts naturally. Split the biscuits open and add about one (1) ounce of ham to each one. After that, put a slice of cheddar cheese on top of the ham and combine the halves. That’s it, your hand-held breakfast biscuit sandwich is done. So, this tip is for the readers who decide to use our homemade biscuit recipe. When you go to add the buttermilk, add it at a half (1/2) cup at a time. Humidity and temperature affects the moisture in dough. 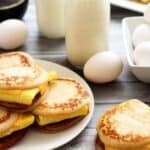 You may not need the whole amount or you may have to use more buttermilk than expected. In regards to condiments for this recipe. Personally, I like spicy brown mustard on my ham biscuits. But you can try ketchup, mayonnaise, or even hot sauce. It’s pretty much comes down to whatever you enjoy. If you don’t care for ham, then try bacon or corned beef. Both of the these meats have a high enough salt content to compliment the biscuits and cheese mixture. If you enjoyed our cheesy ham biscuits recipe, please leave us a comment and rate the recipe card. You can also find us on Facebook, Pinterest, Twitter, and Instagram by searching for Berly’s Kitchen! 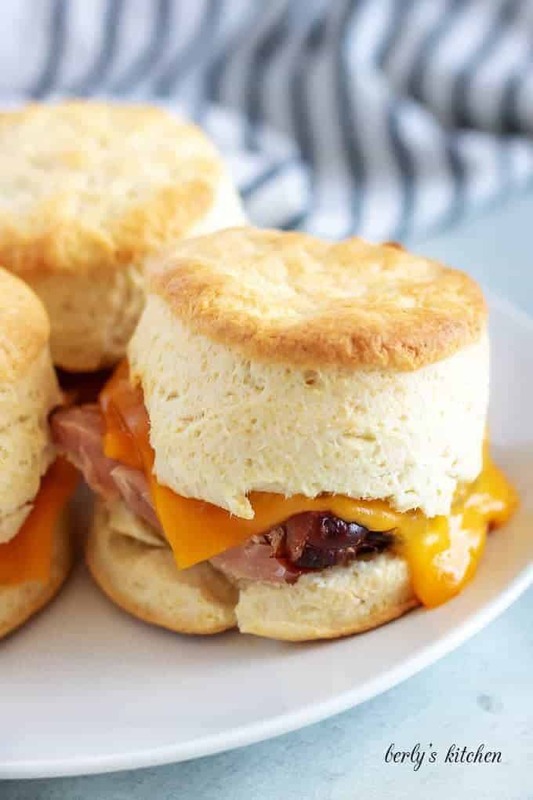 Our cheesy ham biscuits recipe featuring flaky homemade buttermilk biscuits loaded with smoked ham and gooey melted cheddar cheese! Bake the biscuits according to the package instructions. This should only take ten (10) to fifteen (15) minutes. 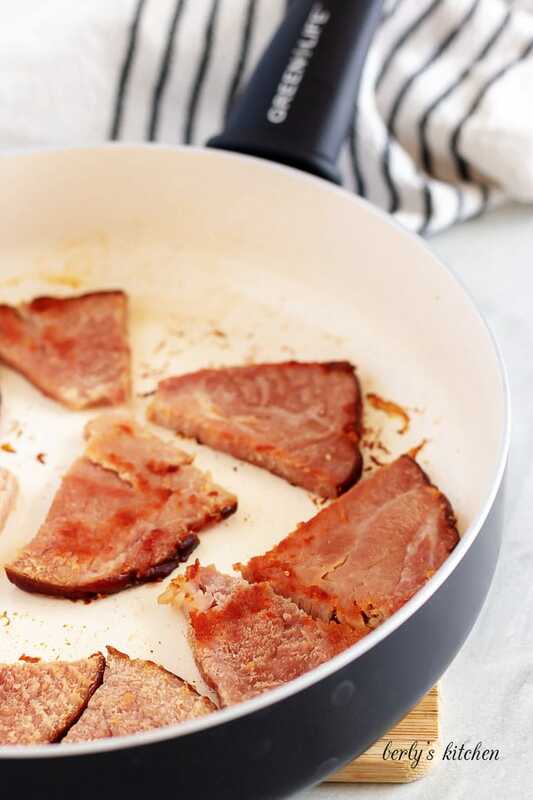 While the biscuits bake, grab a large skillet over medium-heat and sear the ham. Cook it long enough to slightly brown both sides. About three (3) to five (5) minutes. 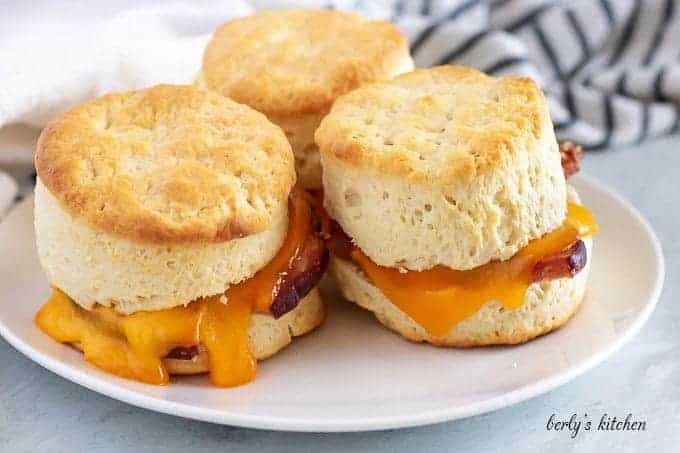 Once the biscuits are done, break them in half and stack on the ham and cheese. The calories listed are an approximation based on the ingredients and a serving size of one (1) ham biscuit with one (1) ounce of ham and one (1) slice of cheddar cheese. Actual calories will vary. 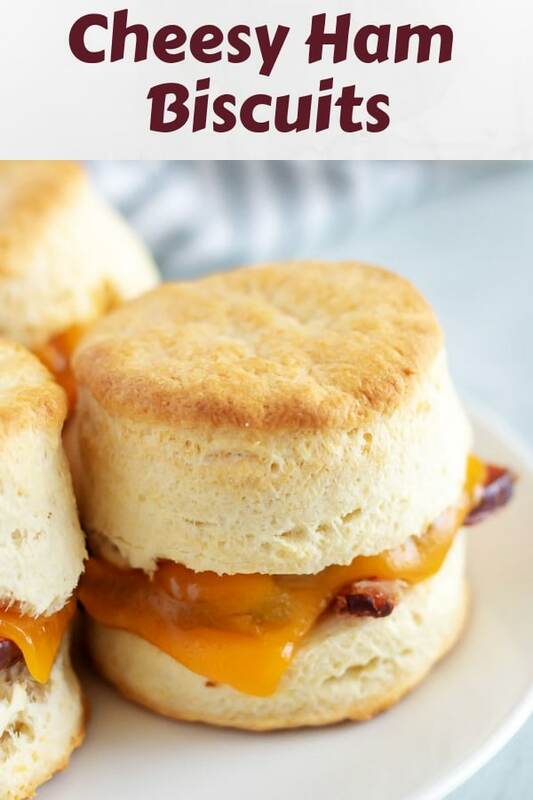 The cheesy ham biscuits can be stored in your fridge in a sealed container for up to three (3) days.